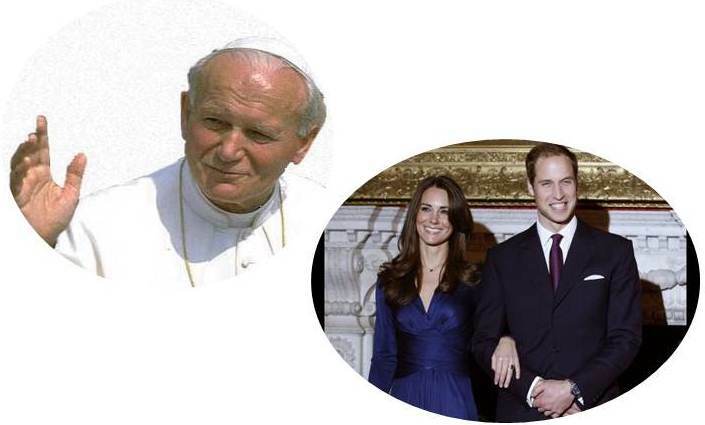 Royal watchers and Vatican watchers are gearing up for this week-end`s celebrations. The upcoming nuptials of Prince William and Kate Middleton have media outlets falling over themselves to grab the exclusive scoop on dresses, menus, and guest lists. Meanwhile, Rome is preparing for the hopeful onslaught of pilgrims for the May 1st Beatification ceremony of Pope John Paul II. Not surprisingly, Will and Kate are stealing the international media thunder. The Wall Street Journal published an online article today describing the Vatican`s disappointments; Pope Vies With Prince for Public Eye. In all fairness, when John Paul II died the non-stop media coverage was a tribute to his global influence inside and outside of the Church. He was the first pontiff to embrace the power of the media, and used it to his advantage. He was the most travelled, most heard, and most filmed and photographed pope. He was often a divisive figure in his own Church, but his influence on the world stage could not be ignored. So, how do we explain the mega-hype over the Royal wedding? What have William and Kate accomplished on the world stage? One was born into privilege and fame. Fortuitous circumstances brought the two together. Where is all the adulation and excitement coming from? Where is the anti-monarchist sentiment that we hear so much about here in the colonies? I know my daughter and I will awake early to view the Royal wedding. I am a bit ready to enjoy some of the fantasy and pomp that goes with these sort of weddings. I am getting frustrated and tired of the heaviness that surrounds the Catholic Church and have decided to skip the NCR articles I receive online each day. Am I hiding my head in the sand? Yes…my stomach needs a rest.